The latest clash between Rome and Brussels, which erupted over the handling of a ship transporting migrants moored in Sicily, has investors worried that given the tensions, Italy is on track to break the 3% budget deficit limit imposed by the EU when it presents its 2019 budget this fall. Italy vs. German 10-year bond yield spread is NOW through the Memorial day weekend wides, what a way to end the summer. The VIX Chicago Board Options Exchange Volatility Index touched 17 during the late May drama out of Italy, compared to less than 14 today. Deputy PM Luigi Di Maio stated that Italy would withhold funding to the EU 28 bloc next year unless other member states accepted the migrants. The European Commission dismissed the threat, stating that the Union “operates on the basis of rules, not threats.” The new Italian administration uses unusually aggressive statements to move towards its policy goals, which may portend to upcoming budget talk negotiations. 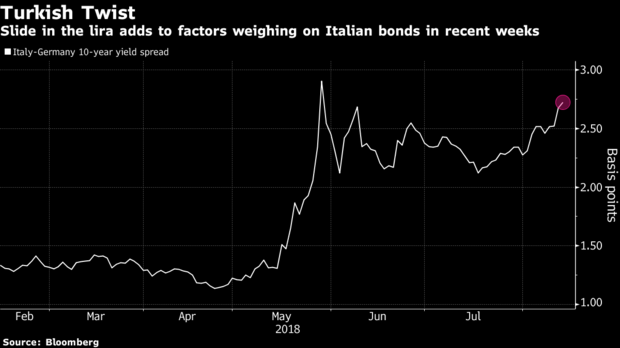 Investors in the Italian bond market anticipate a possible market turndown and yields across Italian government bonds show significant volatility. After recovering from an 8 basis point slump on August 28th, the Italian 10-year government bond yield sank 6 basis point in one day on August 29th. On the other hand, the Italian government downplays the possibility of wider market selloff, stating that the country will maintain the agreed debt-to-GDP ratio on a downward path. However, the yields across the Italian government bond yield curve are higher than they were a month ago, when ECB chief Mario Draghi warned Italy that the ECB would not adjust its policy to allow for a more spending oriented Italian budget. European Commissioner for Budget Guenther Oettinger stated in response to the Italian administration that the move would make Italy the first member state in EU history to refuse to pay budget contributions: “This would result in late payment interests. And a breach of Treaty obligations leading to possible further heavy sanctions,”Oettinger responded. ACG Analytics foresees the Lega-M5S administration adopting a rigid line against Brussels in an attempt to bend fiscal target rules this fall. On September 27th, the government will present its budget update note, followed by the presentation of the budget draft on October 20th. The European Union is also expected to give its opinion on the budget draft in October. Regional elections in Trentino Alto Adige will be held on October 21st and in Basilicata in November. Tesla equity investors obsessed with the stock price are measuring risk-reward with just a piece of the picture. Those you are NOT on top of the entire capital structure are sadly mistaken. In early April, with Tesla junk bonds (5.3% due 2025) near 87 3/8 the equity was trading at $252, today the relationship is 87 3/8 vs. $319, that’s a $70 premium in the equity vs. the credit. After just one-quarter of positive free cash flow since the fourth quarter of 2013, Tesla has $1.3B in debt maturity wall over the next 12 months. After the ferocious burn, cash in the bank is down to $1.3 after backing out $942 million of customer deposits on cars. Is there no better example of such stock price manipulation than Elon Musk’s recent tweetstorm? Around mid-day on August 7, the sleep-deprived CEO of Tesla tweeted that he was considering taking Tesla private, with the compelling byline “funding secured”. Immediately following his tweet, Tesla surged higher but the company itself remained quiet. After three hours Musk sent an email to Tesla employees, clarifying his tweet. Tesla stock ended the day 31.6 dollar (+10.7%) higher, and just above $387 per share. His tweet had boosted the Tesla market cap by $5.3bl that day. The board appeared to have been completely blindsided as were Tesla’s junk-bond selling investment bankers. They confessed that they had no idea the company was working on anything like this. In the weekend following this tweet, and the stock still around$350 per share, Musk was allegedly on the phone non-stop, frantically soliciting investors for his privatization. This was based on the dubious claims from Azalea Banks who stayed at the Musk residence that weekend. On Sunday night Tesla released a cryptic blog statement in defense of Musk’s ill-fated “funding secured” tweet. According to the statement, Musk had several going private talks with the Saudi wealth fund over the years. After his tweet, the Saudi manager of the fund expressed support for proceeding with a privatization subject to financial due diligence and their internal review process for obtaining approvals.” In other words, The Saudi manager had not seen Tesla’s books nor did he know if the fund’s Board would even approve funding such privatization. By then the market started to realize Musk’s initial claim was based on hope rather than an actual commitment. In the meantime, the SEC had announced an investigation into Musk’s tweet and shareholder claims started to surface as well. But the real bombshell came on Thursday night when the NY Times published an interview with Musk that demonstrated the mercurial state of Tesla’s beleaguered Chairman/CEO. Musk claims that he typed the fateful tweet while driving to the airport and no one had seen or reviewed it before he posted it. Moreover, the article claimed that funding was anything but secured because the Saudi fund had not committed to providing any cash, according to people briefed on the discussions. The article also noted that the Tesla’s board and Musk had received SEC subpoenas, and preparing to meet with SEC officials in coming weeks. The following day, the stock dropped 8%, erasing all the gains from the go-private speculation. Investors’ concerns were not limited to the validity of the privatization but also about the mental state of Musk. In the interview, he appeared to be breaking down several times and lamented about having to work 120 hours per week and frequently taking Ambien to be able to fall asleep. A frantic week followed, with Tesla in full damage control. The company named the line-up of investment banks that would advise the go-private transaction. But by the end of the week, the company threw in the towel. In a dramatic U-turn, issued at 11pm on a summer Friday, Musk claimed that it behooved Tesla stay public, never mind the claims to the contrary two weeks prior. In hind site, this entire saga appears to be a giant ruse to squeeze the Musk-reviled short sellers out of the stock. Elon Musk had gone out of his way in recent months to attack critics, going as far as trying to get a Tesla provocateur on Twitter fired by threatening his boss. In addition, Musk tweeted a meme that compared hedge fund managers to Nazi-Germany leadership and publicly mocked Greenlight’s David Einhorn, who is short the stock. The SEC has a history of pursuing many cases of insider stock manipulation. The focus of the latest investigation into Tesla is whether Musk violated the critical anti-fraud SEC rule 10b-5. This rule specifically prohibits any scheme to defraud by misstating material information that affects the value of the stock. Among the penalties would be the SEC barring Musk to be a director or officer of a public company. A violation is not limited to prior intent, the SEC could penalize Musk based on actions that are “a significant departure of a proper standard of conduct”. To add insult to injury, with Tesla now in receipt of multiple Wells Notices (SEC enforcement letter), it’ll be increasingly difficult to raise badly needed capital. In general, companies that are under undisclosed SEC investigations do not raise capital. We are eager to see whether the SEC succeeds in its investigation and pursues legal action against Musk. The SEC has punished many CEO’s for lesser violations but Musk thus far has demonstrated to be above the law. Numerous NTSB investigations into self-driving vehicle accidents have amounted to nothing. The SEC is already investigating Tesla about its disclosure of production issues while whistleblowers are alleging spying of employees and drug dealing on the factory floor. We are increasingly witnessing the presence of a two tiered-justice system, where lady justice looks the other way with malfeasance by the business and political elite. The SEC has an obligation to show us that Tesla and Musk are no longer above the law and get the same treatment as the general public. The emerging market foreign exchange basket just witnessed its largest 4D drawdown since Lehman. That’s a -5.3% shift for a 5.2 standard deviation move over a ten year period. This is an exceptionally powerful move which has NOT come to us without follow-on implications. Over the last hundred years inside financial markets, we’ve found in each crisis there’s a metamorphosis, a transformation into another serpent, a far different beast. In the 1970’s it was runaway commodity prices, a real energy crisis. In the 1980’s, it was Savings and Loans. The 1990’s brought us sovereign credit defaults (Russia / Long Term Capital) and the dot-com blow up. By 2008, a full-blown sub-prime mortgage crisis was upon us. The sad fact remains, central bankers along with regulators are often caught looking in the rearview mirror. They’re literally oblivious to risk – we call them academics with blinders on. Lost in the woods, this crowd has done a great job at taking leverage down inside large banks. Yet, all they’ve really accomplished is a transfer of the leverage onto both sovereign (country) and corporate balance sheets. Over long periods of time, when you prevent the cleansing process of the business cycle from functioning, capital oozes around the world into all the wrong places. Bottom line, nice work central bankers (FOMC, ECB, BOJ, BOE, PBOC), you lit the fuse and now it’s about to explode. Turkish Credit Default Swaps – a key instrument investors use to insure against financial turbulence – surged to their highest since the 2008 global financial crisis as the lira took another sharp dive in world currency markets. Five-year Turkish CDS jumped 78 basis points to 529 basis points, data from IHS Markit showed. Why a Strong Dollar Matters? *$64T dollar-denominated, nearly all issued over the last 10 years. Late this week, the cost of insuring against a debt default in Turkey overtook that of Greece, which is rated four notches lower by the “brain trusts” at Moody’s. At the same time, investors sliced exposure to emerging markets as Turkey’s currency meltdown fueled contagion concerns and a host of global hot points added to the exit from riskier assets. There’s a “Price to Pay” for the easy money Gravy Train which has come out of central banks. 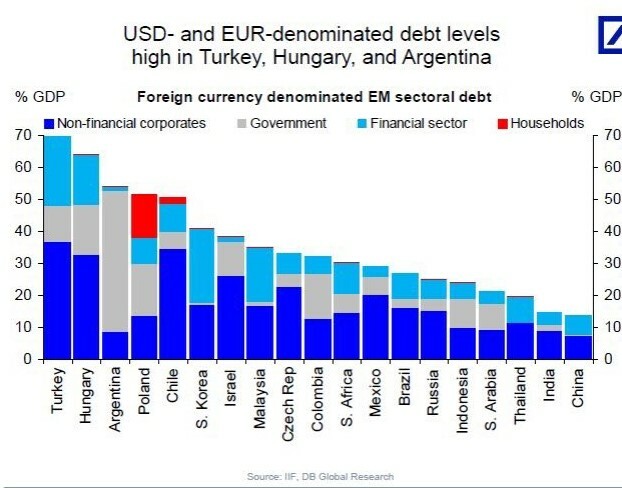 Thanks to a Reckless Fed and ECB, Turkey was able to pile up loads of debt – NOT denominated in Lira BUT Dollars and Euros, TURN OUT the Lights. The likeness of 2018’s Turkish credit crisis and the Asian credit crisis of 1997 is very real. If you think of Turkey’s external debt near $450B, that’s nearly 57% of GDP. Next, add on colossal corporate debt layers (see above) – you’re in a HIGHLY unsustainable neighborhood, near 70% of GDP. Back in 1997, Thailand’s external debt was $110B or 64% of GDP, the panic that followed rocked global markets. Over the last month against the US dollar, Turkey’s lira -48% (since July 6th) while one month into the Asian financial crisis the Thai baht was -24% against the US dollar. In rare company – the lira’s recent collapse exceeded daily losses during Russia’s 1998 default and Brazil’s 1999 real crisis. In June, in a rare public tongue-lashing, the Bank of India governor pleaded for the US central bank to relax balance sheet tightening plans, they didn’t listen. The Turkish Lira has plunged against the dollar to record lows this week, fueled by concern about the nation’s worsening relationship with the U.S. and authorities’ ability to anchor the nation’s assets. With close to $250B of US Dollar and Euro denominated DEBT, every 1% move lower in the Turkish currency brings a nasty 5 billion Lira interest coverage problem, it’s good night Irene. In nearly every substantial macro-driven risk-off period, as the crisis kicks off US equities ignore the drama. There’s a beautiful point in every market cycle; macro takes over lazy thinking. It’s a unique, special place in which all participants have to dig deeper into what’s actually going on within the solar plexus of the global economic system. WE ARE THERE RIGHT NOW, peace. Clients are asking if this is 1998 all over again? We say yes. A Lira move near seven (close to a 6 handle now) wipes out most of the equity in Turkey’s banking system, and that’s on a $1T economy. Contagion? EU banks are 7% – 10% lower this month! Europe is facing BOTH US sanctions and tariffs on their major trading partners (China, Turkey, and Russia). Above all, Europe’s banks are holding the bag – that’s the problem. Here are the bag holders. As of Q1 2018 Spanish bank exposure to Turkey 82.3bn dollars, France 38.4, UK 19.2, US 18, Germany 17.1 Italy 16.9 Japan 14. Switzerland 6.3 Canada 1.2 Austria 1.1. Portugal 0.3. Turkey’s Lira touched a record low of 7.23/USD, the Argentina peso and Brazil’s real reached their weakest point in a month, while the Russian ruble plunged to its lowest level in two years – DEFAULT risk is RISING fast. There’s clearly a flight to quality into German bunds, more disturbing is the price action in Italy’s yields moving higher on the heels of Turkish drama. Yields on two-year securities climbed to the highest levels in more than a week as stocks worldwide declined following a 29 percent tumble in Turkey’s lira this month. Bloomberg noted the Italian 10-year spread over German bunds hit the highest since May. Deputy Prime Minister Luigi Di Maio was reported as saying in an interview Monday that his country won’t be subject to an attack by speculators. Foreign banks in Turkey are exposed to the local government debt for $120 billion: French and English banks are first in line, with $40.4 and $23.9 billion respectively. – BIS Data. At the same time, momentum is building in the US Senate for additional sanctions punishing Russia for election-meddling. The run-up to the U.S. midterms in November is a critical period for U.S.-Russian economic relations. There’s clearly a Euro impact here. Not to mention Germany’s largest trading partner in China facing tariff risk. Too many investors are hiding out in US equities. Tariffs on China, US sanctions on Turkey and Russia – that’s over $15T of global GDP under substantial stress. It would be nice if the US equity market was on an island, protected from the global economy – but that’s not the case. Turkey’s exports to Russia soared 52.5% last year, up to nearly 6% of GDP. As a result, US sanctions on Russia just add to the Turkish economic dilemma, it brings DOUBLE trouble default risk. US Russia sanctions + Turkey Sanctions = Rising Credit Risk. Where’s the trade? Pick up our latest report here.